The new-to-me Nintendo DS “Personal Trainer Walking” (heck of a name..) alongside of the Japanese language game whose name I forget and cannot read. I found out about this Nintendo DS game from Kevin who found out about it from Russell. I literally just got it yesterday, but it’s pretty exciting to see. I can only imagine in my head out the play dynamics unfold, but I’ll be playing with it and have some more thoughts before long. So far I enjoy the “blind” design of the pedometer part of the concept — not too much display other than this blinking light which changes color when you’ve reached your goal. 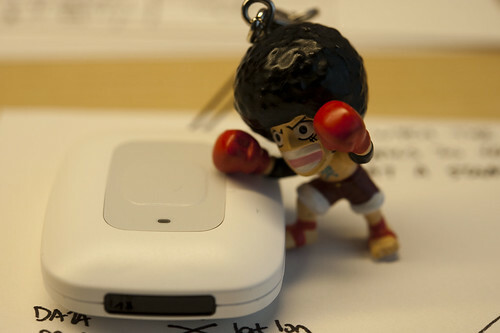 Simple, direct and not a nagging taunt from a fancy LCD that shows more than you need. You focus on your activities or just being a normal human being without poking and prodding at the device all the time, checking your status in detail, etc. When you’re in the world, be in the world, I say. The meter should only be used by a person or dog. It will not work properly with any other type of animal. 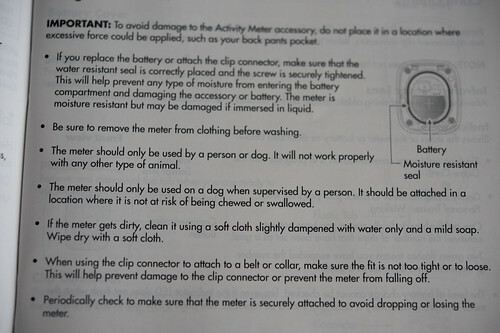 The meter should only be used on a dog when supervised by a person. It should be attached in a location where it is not at risk of being chewed or swallowed. Great stuff. I’m looking forward to seeing how the DS experience works. Downside: I’m pre-disappointed that walking is the only physical activity it seems to work with. I ride a bike and want this to count. And there are so many other sorts of physical things that won’t count, I assume. Russell points out the simplicity of the synchronization ritual, which is fantastic. Point. Press. 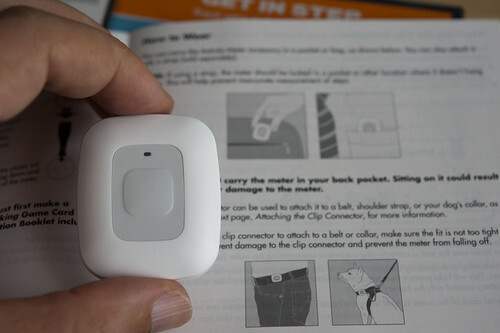 Watch your pedometer pebble appear from a pipe on the screen and become “alive” on your screen. If you’ve ever tried to synchronize ANYTHING you’ll laugh out loud, as I did. If you’ve ever designed ANYTHING that requires synchronization, take close note of the interaction ritual here. It’s fantastically playful and simple and sensical. Some related topics: this perpetual Laboratory project, Flavonoid. 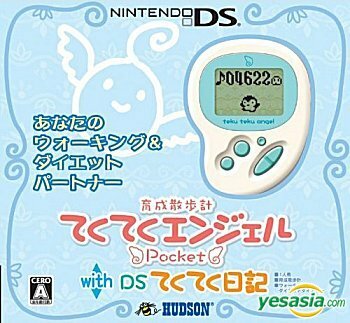 Nicolas sent me information about this DS-compatible pedometer toy called Tekuteku Angel Pocket Pedometer, which looks very cool. Hudson Soft has created a new pedometer game where the weight of onscreen characters fluctuates depending on the number of steps taken. As additional encouragement, Tekuteku Angel Pocket, displays messages of its screen such as — Nice walking!â€ if you’re doing well. 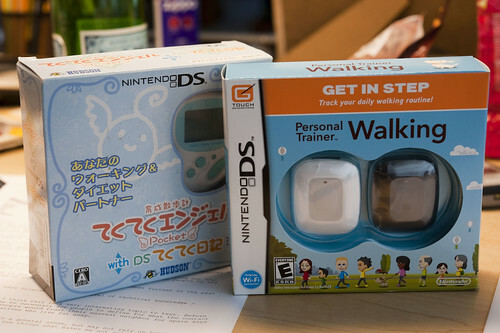 Furthermore, the pedometer can be hooked up to your Nintendo DS using the DS Tekuteku Diary in order to keep track of walked steps along with calorie info and other health data. The pedometer and diary will go on sale on 21st December for 5,229 yen (£23/$44), and later in January, supposedly, in the U.S.
You can pick up a ice blue one or a pink one at Yesasia.com.